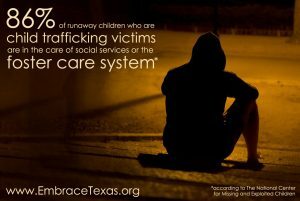 Children are in foster care because they, or their sibling(s), have experienced abuse and/or neglect. Having experienced trauma in their lives, these young children are particularly vulnerable to being exploited by outside persons. When a child is in CPS conservatorship and runs away, it is extremely important that the agency put every effort to quickly locate the child before they are exploited. No later than 24 hours after receiving information on missing or abducted children or youth, providenecessary information to law enforcement authorities for entry into the National Crime Information Center (NCIC) database of the Federal Bureau of Investigation (FBI) and provide necessary information to the National Center for Missing and Exploited Children.